Procrastination - Read This NOW! After all, alphabetizing requires focus and effort — and hey, maybe you even went the extra mile to wipe down each bottle before putting it back. And it’s not like you’re hanging out with friends or watching Netflix. You’re cleaning — something your parents would be proud of! This isn’t laziness or bad time management. This is procrastination. If procrastination isn’t about laziness, then what is it about? She added: “People engage in this irrational cycle of chronic procrastination because of an inability to manage negative moods around a task.” Wait. We procrastinate because of bad moods? In fact, there’s an entire body of research dedicated to the ruminative, self-blaming thoughts many of us tend to have in the wake of procrastination, which are known as “procrastinatory cognitions.” The thoughts we have about procrastination typically exacerbate our distress and stress, which contribute to further procrastination, Dr. Sirois said. But the momentary relief we feel when procrastinating is actually what makes the cycle especially vicious. In the immediate present, putting off a task provides relief — “you’ve been rewarded for procrastinating,” Dr. Sirois said. And we know from basic behaviorism that when we’re rewarded for something, we tend to do it again. This is precisely why procrastination tends not to be a one-off behavior, but a cycle, one that easily becomes a chronic habit. Over time, chronic procrastination has not only productivity costs, but measurably destructive effects on our mental and physical health, including chronic stress, general psychological distress and low life satisfaction, symptoms of depression and anxiety, poor health behaviors, chronic illness and even hypertension and cardiovascular disease. But I thought we procrastinate to feel better? Unfortunately, we can’t just tell ourselves to stop procrastinating. And despite the prevalence of “productivity hacks,” focusing on the question of how to get more work done doesn’t address the root cause of procrastination. O.K. How do we get to the root cause of procrastination? That may be easier said than done, but try to reframe the task by considering a positive aspect of it. Perhaps you remind yourself of a time you did something similar and it turned out O.K. Or maybe you think about the beneficial outcome of completing the task. What might your boss or partner say when you show them your finished work? How will you feel about yourself? What are some other, healthier ways to manage the feelings that typically trigger procrastination? That's a very long article. I'll get round to reading it later. I will read tomorrow or Monday. It's Saturday night man! I'm waiting for my phone to charge so I can go out. I could have done it sooner. I've got a book on my shelves titled "Stop Procrastinating." Haven't read it. Seriously. How do you make procrastinators read things that are going to help them! You may be a hopeless case. The problem with procrastination is that it's half-assed. If you don't want to do something don't do it and, even more importantly, don't worry about it. Well as a chronic procrastinator I made myself read it immediately and found it thought provoking and potentially helpful. Apologies for letting down the Wider OTF. I procrastinate because it works. Somebody else does the thing you've put off. Or it's overtaken by external events. That difficult discussion you needed to have with a neighbour about where he parks the car ... is no longer required, it got scratched by vandals, he's taking it off the street and you can be fake-sympathetic instead. If you want to go to the gym before work but you’re not a morning person, sleep in your exercise clothes. It's all a bit Alec Guinness in Bridge on the River Kwai, where the need to Get The Thing Done has chased out any reflection on whether you need to be doing it at all. (Fact: I once delivered leaflets for the SDP. In the rain. Did not procrastinate. Where's my reward?). Well, it works sometimes, but it's not exactly a fail-safe policy to run your life by. The essential message of the article, that procrastination isn't about laziness, that's it's mood or anxiety management, certainly resonated with me. And when that's understood, finding ways to counteract the urge to procrastinate or using tricks to reduce its power, it's easier to overcome. It's almost a form of CBT I suppose, but it resonated for me too. Remains to be seen whether I actually do anything differently as a result, mind. Sits: I literally had the same thought. I just couldn't be bothered posting it. It can also work if you're someone who performs better under time pressure. For example, my students seem to believe that an essay is better if you do it the night of the deadline because you're forced to focus on it. I skim-read that, and yes, I know procrastination is a form of self-sabotage and it gives me a rush of sorts. Someone called me a "successful failure" once and said it must have taken real dedication not to do really well. If you do your work at the last minute, you can tell yourself that you could have done so much better if you'd actually worked at it. I used to do my homework on the bus, or even literally walking into class, and still get As. I don't know what effect that had on my psyche combined with my crappy parenting but I've been playing chicken with myself ever since. Right now, I need my client company to keep paying me good money after June, so I will have to do a bit more. I actually did my French homework in good time (the night before) last week. As for the book I have half-written, I was at a friend's booksigning last night at the Groucho, and I felt a twinge of envy and shame. I know we're not supposed to beat ourselves up, but. I could write as good a book as he has, but he's sat down and finished it. I'm going to take Facebook off my Mac, that might help. Actually overcame my procrastination yesterday, just about to begin again now. Much of that article resonates with me. Thanks for sharing. No one else is going to clean my gaff. My procrastination gets me exactly where I am now: overwhelmed and depressed and horrified that someone might come in and see that I'm basically living in a hoarder house. I suppose like most procrastinators I've managed to devise the odd trick or tactic over the years to deal with it. The first one is to focus on a really rotten pending chore, the absolutely worst job on your list. As soon as I do that, every other job almost magically seems a lot more attractive, easy even. Secondly, don't think. Don't plan the job, or think about planning the job, or think about what it will entail or how long it will take. Clear your mind and just start it. Within a couple of minutes you've made some progress and have momentum. Apologies if the above seems trite but they've worked for me. Last edited by Nocturnal Submission; 21-04-2019, 23:27. 2. You share photos of your place and it always looks great. I never said I was a hoarder--I have no emotional attachment to my clutter (well, not to 90% of it anyway). But my apartment does look like a hoarder lives here. Any photos I post of my pets are carefully staged or cropped to avoid including the hoard. Here's a photo I just took standing in my living room looking at my front hallway. There's another pile in the dining room and another in the opposite corner where my home office is. As embarrassing as it is for me to show this to anyone, I need to, because I don't want anyone thinking that I'm exaggerating the situation. It is overwhelming. Well, firstly, thank you very much for feeling that you can trust us enough to share the problem and for having the courage to do so. 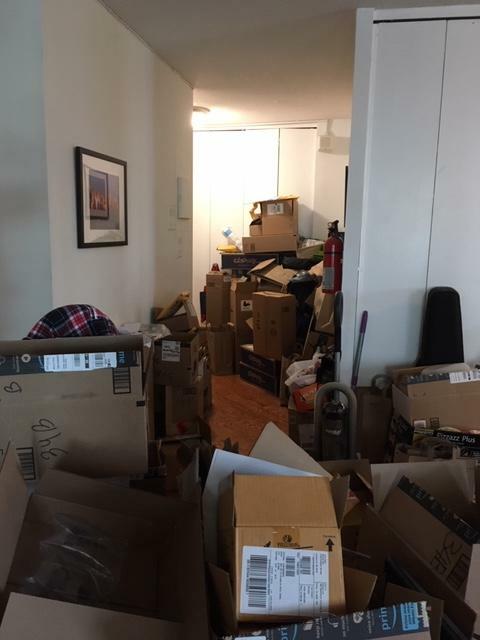 There seem to be a lot of boxes in the picture. Are they all empty, or at least the majority of them? If so, just dealing with those and the packing materials inside would be a great start.